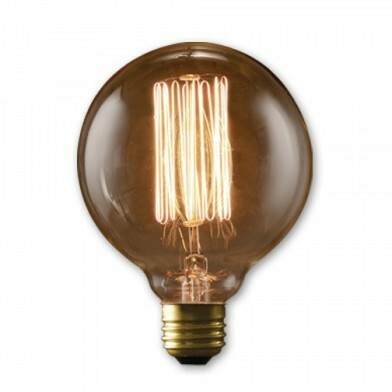 G30 Globe Decorative Antique Bulb (Edison Bulb), Medium E26 Base, 40 Watt 140Lumens, 3000 Hours, Thread Filament, Clear Glass. Single Pack. *** All Fixtures on Displayed Photos are Sold Separately, Please be Advised. Meticulously handcrafted to preserve the look of early 20th-century lighting, Bulbrite's Nostalgic Globe Collection is the perfect complement to any vintage or contemporary décor. Recognized for their antique finish, defined steeple and intricate filament design, these bulbs are ideal for any transparent light fixture, both indoor and outdoor. Shatter Resistant options are available by special order. Contact a Certified Lighting Specialist at 905-604-6076 or cs@bulbspro.com to get a quote today.